Melt the sugar in a heavy based saucepan over a low heat. Once you have a reddish-brown caramel, add the water a spoonful at a time. Once all of the water has been incorporated, pour the caramel into individual ramekins and set aside. Place the milk, star anise and cinnamon stick in a saucepan. Grate in the zest of the orange. Slowly bring to the boil, allowing the flavours to infuse. Beat the eggs and sugar together in a bowl. Once the milk has come to the boil, remove the cinnamon stick and the star anise. Slowly whisk the hot milk into the eggs and sugar, mixing well. Pour the liquid on top of the caramel in the ramekins and then place in a large roasting tray. Pour in enough water the come halfway up the sides of the ramekins then carefully transfer to the oven and cook for 45 minutes. Remove from the oven and allow to cool. Refrigerate to ensure the dessert is served cold. 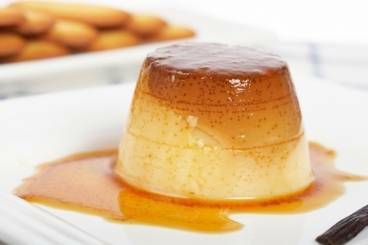 To remove the crème caramels from their moulds, dip the ramekins into a shallow dish of hot water to loosen the edges. Turn the crème caramels out on to small plates to serve.